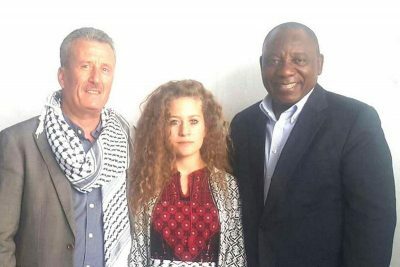 Palestinian teen activist Ahed Tamimi – who was released on Sunday from an Israeli prison after serving an eight-month sentence for slapping an Israeli soldier – will be invited to South Africa to receive a special award for her bravery, resistance and being a symbol of hope for millions reports the Afro-Palestine Newswire Service. Ahed Tamimi’s mother, Nariman, was also released on Sunday after being imprisoned on charges of incitement for sharing a live recording of her teenage daughter standing up to the fully-armed Israeli soldier in December. Speaking immediately after her release from her home in the village of Nabi Saleh in the occupied West Bank, Ahed Tamimi said that while she was happy to be reunited with her family, she could not forget other young Palestinians who still languished in Israeli prisons – including her brother and two cousins. Amnesty International has cautioned that Tamimi’s release must not obscure the Israeli military’s use of discriminatory policies to lock up Palestinian children. “While Ahed’s freedom is welcome and long overdue, it must be followed by the release of the other Palestinian children unlawfully imprisoned by Israeli military courts,” said Saleh Higazi, head of Amnesty’s Jerusalem office. According to the Addameer prisoner support group, of the approximately 5900 Palestinian political prisoners currently being held in Israeli jails, 291 were children. The 17-year-old Ahed, who has since become a global icon of resistance, also relayed messages from Palestinian female political prisoners, calling on Palestinians to remain strong and united in their resistance to the Israeli occupation. Image on the right: An Italian artist painted an image of Ahed Tamimi on the Separation Wall in occupied Bethlehem. Tamimi and her mother were arrested by Israeli forces in December 2017 after a video went viral showing the young woman, then 16, hitting and slapping two armed Israeli soldiers outside her home in Nabi Saleh. At the time, the teen was reacting to news that her 15-year-old cousin, Mohammed, had been shot in the face by Israeli forces with a rubber-coated steel bullet earlier in the day, leaving him in critical condition. The teen’s arrest drew international condemnation and put the spotlight on Israel’s arrest and imprisonment of Palestinians, especially Palestinian children.